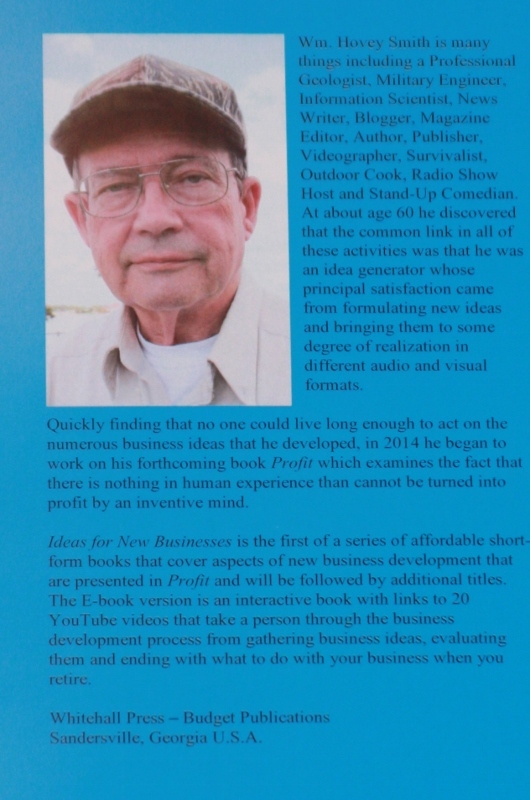 All new businesses, from the largest to the smallest start with an idea. 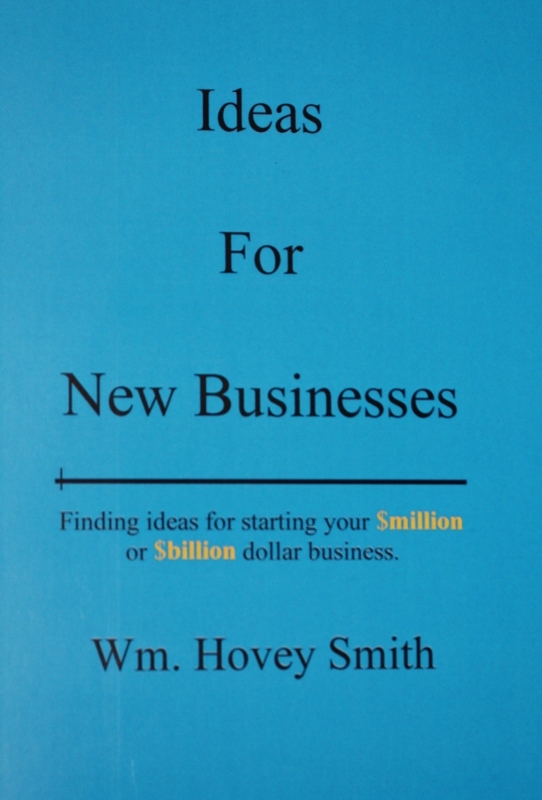 To this end I introduced a slim book “Ideas for New Businesses” that provokes the reader to draw ideas from four universally available sources and provides a log section in the rear of the book for recording them. This way the time spend on long cross-country or international flights can be usefully employed. Writing in your own log book provides a document that will never appear on any company computer, are free from your company’s prying eyes and will remain a portable, lifetime asset that can stay in your computer bag. The E-book is available exclusively from Amazon.com, and the softcover may also be purchased from Amazon and most other booksellers or ordered from your local bookstore. No one in corporate America can say that their jobs are secure. Even top-level administrators may find themselves redundant due to a merger or some new technological advance may eliminate “his” market area. It is good practice to have some ideas in various stages of development that may be used to sell your services to another company or use as a base on which to build your own business. Analyzing which of a dozen of these ideas offer the best potential to supply personal needs is the tricky part of the process. Among the many constantly changing variables are your personal experience in this field, sales potential, marketing approaches, needs for trademarks and patents, business location, manufacturing capacity, development time, product testing, raising capitol and the demands on your time. The Log Book section of the book helps in that it has different sections for short-term, medium-term and-long term projects. A medium term project might require the building or testing of a technique, software or prototype; whereas the long-term projects might require additional education for you, partners and the construction of a new manufacturing facility. It is convenient to ferret out the most significant factors and give them numerical rankings to make a split between the more obviously good and less-good choices and a future book will take the reader through this process for various types of businesses. There is another possibility for a person who has strong business instincts but is still in college, just graduated or has had his life completely turned upside down due to displacement from his home country. I offer a three-month internship where a guy or gal comes and lives with me in my house and we work 10 hours a day, 7 days a week for three months. For 5 of those days he assist me with my projects and for 2 we work jointly on his. The objective is to identify what this person’s marketable skills are, how they may be best developed, do limited real-world testing, and provide the intern with a variety of skill sets that are needed to be successful in today’s marketplace where businesses need to make maximum use of Social Media techniques such as YouTube Videos and PodCast radio. Because of my wide experience in industry, science, the arts, military, engineering, environmental science, manufacturing, product development, promotion, marketing, etc., in some weeks I can tease out a person’s real interests and test his abilities and construct a company structure where he would be willing to make the 24/7 commitment that is needed to grow a company into one with multi-million dollar sales potential. These days the only difference in having a company with the potential for multi-million dollar sales and one that just provides survival levels of income is often the lack of vision to see a regional and national market potential, compared to having one store among thousands in some metropolitan area. Nor, these days, is there a need for new business with world-wide reach to be located in one of the world’s capital cities. The most wealthy family in America, the Waltons, still run their operations out of Bentonville, Arkansas. Anyone with vision, forethought and will can do the same. I take only one intern at the time. The up-front costs is $10,000 paid in advance. This covers room and meals and most travel expenses for the intern. If a family is involved, they are housed nearby at the intern’s expense and he or she returns to them after the work for the day has been completed. If they want to work as a husband-wife business team, they can live together at my house an both be trained at a costs of $15,000. At the end of the internship the goals are to have selected a business opportunity, named their business, written a business plan, secured a business license, applied for a trade mark, started work on any necessary patents, completed a portfolio of advertising materials, produced YouTube videos, E-books, music (if appropriate) and be in some stage of securing financing for their business. After three months our new business owner is on his own to find partners, coworkers and collaborators to form virtual project-oriented companies, return to college to pick up needed additional trainings and recruit people into his organization. I am available for consulting fees on an as-needed business, but take nothing from the business for 5 years. If after 5 years, the business makes a profit I receive 1 percent of profit. If it does not the business is liquidated and all trademarks and patents revert back to me plus $25,000. Any legal or other liabilities; however, remain with the owner. If the business is profitable the owner receives full title to the business and may do with it as he wishes, except that I continue to receive 1 percent of profit from the business’ product line and derivatives thereof. I am very selective about who I take as interns. The intern must have excellent English language skills. I need an application consisting of a Resume, a 1,500 word essay explaining why they think an internship would be of value to them and what they hope to achieve from it based on viewing some of my more than 400 YouTube videos and a brief YouTube that they have shot illustrating how to do some practical task of every-day living. This might be a cooking video, how to use a tool, making something, etc. These are not expected to be of TV quality, but shot and produced with simple home equipment. I do not want, take, accept or tolerate reluctant students. If an intern is unable or unwilling to do the work, they are dismissed and any fees are forfeit. If he is willing and able, I will do everything in my power to help insure his success. Depending on his ability and interests, this might even include being invited to become a Board Member of the parent organization.